Men and women in the Old Testament often wandered around in the wilderness. It was a fairly nomadic existence. Whenever they had profound encounters with God, they would often construct an altar. When Jacob had a dream in which he saw angels ascending and descending from heaven, he took some rocks, set them up, and called it Bethel: the House of God. These days we can’t exactly go around throwing up altars when we have encounters with God (the permit costs would go through the roof), but we can mark out time. That’s what the church calendar does: Advent, Christmas, Lent, Easter, Pentecost, All Saint’s Day. They are all signposts. Reminders of our spiritual journey, reminders of what Jesus did for us. Ideally, we don’t need those reminders. We live our lives following God to the full tilt every single day. That doesn’t always happen. We get distracted. The various things of life grab our attention. Reminders such as Lent bring God back into focus. It’s a signpost that I pass every year. It reminds me that Good Friday and Easter are coming. Let’s face it. As far as the time spent on it, Christmas eats Easter’s lunch. Now part of that is because businesses have not figured out a way to so thoroughly commercialize Easter that people spend tons of money decorating, buying presents, and throwing parties. I’m sure they’re working on it. But the church follows suit as far as how much attention is paid. Starting around Thanksgivingish, the church goes all out for Christmas. We begin to sing Christmas songs in our services. We decorate our buildings. We have a ton of Christmas programs, some of which involve giant singing Christmas trees that consume humans. We throw parties. Christmas is the Church Super Bowl. Easter, at least in the Baptist church where I grew up, seemed like almost an afterthought by comparison. It typically consisted of Palm Sunday and Easter Sunday. There was no buildup, no anticipation. It just kind of happened and then we moved on. And that’s odd. If there’s no Easter, there’s no Christian faith. Christmas is important. It’s a huge part of the story. But Easter…my gosh, where would we be without Easter? Lent prepares us for Holy Week, the crucifixion, and Easter. It asks us to focus on what Jesus did for us. It asks us to sacrifice so that in some small way we can get a sense of Christ’s sacrifice. Breaking the fast after Easter, in small ways brings us back to life. 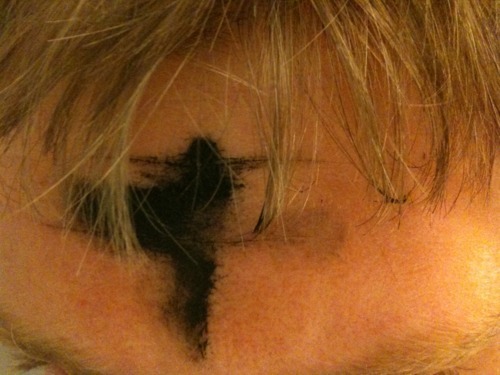 When I go to church this evening for our Ash Wednesday service, one of my pastors will make a cross with ashes on my forehead. And then they will likely say something to the effect of: “Remember that you are dust and to dust you will return” and “Turn away from your life of sin.” Some folks believe that people whom observe Lent do it to feel religiously superior (and, no doubt, there are people that do that). Ash Wednesday actually does just the opposite for that. It brings me back to square one. It reminds me that my life is fleeting. It reminds me that I am sinful. Ash Wednesday reminds me that I am frail and I am fallen. That is about as far as I can get from a religious ego boost. It is a reality check and it is a needed reality check. The funny thing is that is not only extremely humbling, but it provokes this profound sense of gratitude. Because it reminds me that God loves me: a screwed up person whose existence on earth is only a blip, a fallen man that will struggle to maintain a not-very-demanding fast for forty days. We are dust, but we are dust that God loves in a way that we could never imagine. Things can awry with the fasting thing. It can become spiritual one-upmanship. You only gave up french fries? Well, I gave up caffeine and watching TV. That’s not the point of Lent. Otherwise we’d just call it The Annual Pharisee Games. Nor should it be some food or drink that you give up because you are trying to look better for the spring/summer. But when you give stuff up, it is supposed to serve as a regular reminder of what Jesus has done for you (and why it needs to be something of which you would actually partake). You don’t announce it to people, but when you don’t drink that Coke you can pray God, thank You for all that You have done. Thank You for Your great sacrifice or something to that effect. The point is not calling attention to yourself but calling your attention to God. When that happens, giving up is an incredibly good thing.